Andrea Bocelli: Tuscan Skies is an intimate musical journey with the great Italian tenor, Andrea Bocelli. 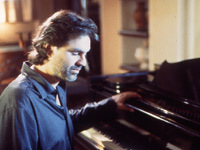 Most of the songs featured in this program are new and have been especially written for Andrea Bocelli, as they are based on and inspired by his own memories and fantasies. Each song at once celebrates Bocelli's soaring spirit, while it is also rooted in the landscape, the people and the soul of his beloved Tuscany. Andrea Bocelli: Tuscan Skies is the most personal musical expression yet of this great artist, as it is infused with his own inspirations and his own deeply held values. Interwoven throughout the program will be a number of vignettes of him at home with his family. Emmy award-winning director Larry Weinstein filmed this program in some of the beautiful towns of Tuscany as well as some of the little known grottoes and Tuscan sights that are firmly entrenched in the memories of Bocelli. These scenes will provide a visual backdrop for his own spoken narration - the words illuminating the meaning of each of his beautiful songs.